The Schrader & Engo-Flator spark plug air pumps. Homepage. This page: Sit back and let the engine take the strain of inflating a car's flat tyres with these air pumps. Schrader spark plug tyre pump. Few things while out on the road are more annoying than developing a flat tyre, and if the spare's flat too, then you're really in a pickle. This first product, the Schrader Spark Plug Air Pump, was designed in the 1950's I believe, while the Engo-Flator featured further down the page dates to the vintage era (of which more anon). Such a gadget could well have been a god-send if you found yourself with a slow puncture, in the middle of nowhere, with no-one to help out. Many drivers were in the AA or RAC, but unless there was an available telephone nearby, from which to request the assistance of a mobile patrol, you'd be stuck. A footpump would get you out of trouble if you had a slow puncture, but they require a little effort and not everyone was keen, or able, to wade in with a Dunlop Major or a Kismet Baby and start pumping away. Perhaps an air pump was the answer? I found an example of the Schrader air pump at a sale a few years back, and in 2010 this original sales leaflet turned up. The cover shows a relaxed chap, leaning on the front wing of his van - possibly a Commer Cob - with the air pump in full flow. The basic idea was that you'd remove one of the car's spark plugs, and screw in the Schrader air pump. The other end featured a connector suitable to attach to the tyre's valve. You'd then fire up the car's engine - running on one less cylinder obviously - and the compressed air from that cylinder would gradually inflate the offending tyre or inner tube. Here is the easy way to inflate tyres with the new improved Schrader Spark Plug Air Pump which eliminates all the physical effort of hand or foot pumping. The pump body is fitted to the engine in place of a spark plug and the thumb lever connection at the other end is attached to the tyre valve. When the engine is running slowly it pumps cool, clean air at the compression figure of the cylinder used. The Spark Plug Air Pump has many uses in providing compressed air facilities away from garage and service station and is invaluable to motorists, caravanners, farmers, truck operators, fire stations etc. Apart from tyres it can be used for inflating air mattresses and pneumatic boats, maintaining pressure in pressure water cisterns and tanks from which paint or garden spray guns are operated. Two models are available - standard type and the gauge type. How the air pump works. The Spark Plug Air Pump utilises the induction and compression strokes of the normal four-stroke engine cycle. On the induction stroke air enters the cylinder through the breather slots in the pump. This atmospheric pressure neutralises the suction of the downward motion of the piston and prevents the normal entry of petrol mixture into the cylinder through the open inlet valve of the engine. On the compression stroke both inlet and exhaust valves are closed as usual. 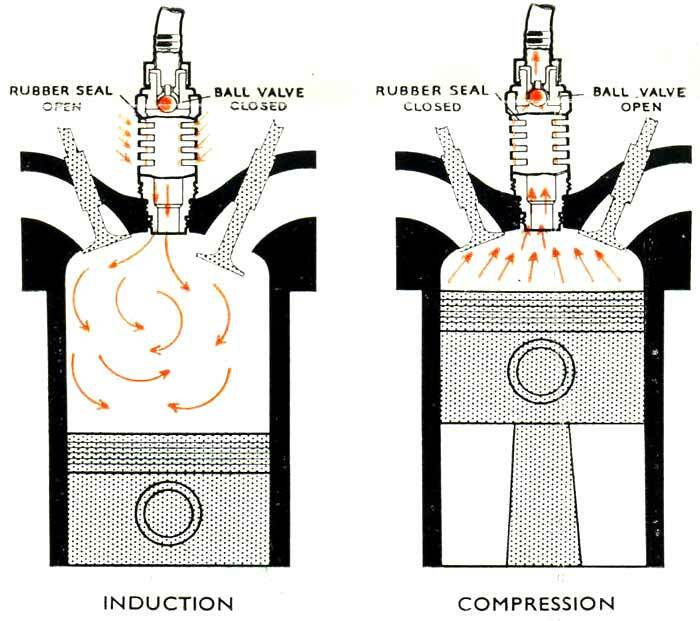 Meanwhile, compression of the air by the piston closes the seal over the breather slots and causes the ball valve to open, allowing the compressed, clean air to pass through to the tyre. A reasonably good engine run at idling speed will pump 80lb pressure and up. More than one pump can be used from one engine when greater volume, not pressure, is required. The pump will do no harm and operates best when the engine is just running slowly. A diagram shows the process visually. The pump was designed to fit on engines fitted with 14mm, 18mm and 7/8" spark plug threads, making it suitable for most petrol-engined cars. An extra 12ft extension hose was also available, suited for inflating trailer tyres etc, if the standard 16ft hose of the gauge type pump (or 12ft of the standard pump) wasn't sufficient. I've yet to try mine, but looks like a handy bit of kit. 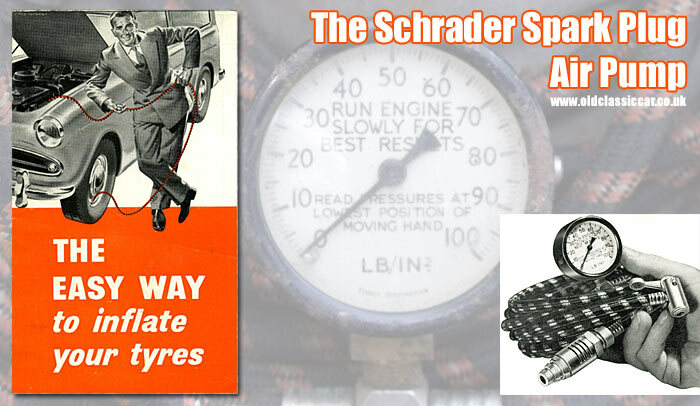 Schrader was, and is, known for tyre-related gadgets, accessories and parts. How long these were manufactured for I'm not sure - modern car engines, with all the electronic non-essentials they're saddled with, probably wouldn't approve of the engine running with one cylinder and its spark plug out of action, but for a classic car it seems like a handy idea. Anyone who competes in vintage trials, where tyres and regularly deflated then re-inflated, could also make use of this air pump. Some seven years after first publishing this page, an idle flick through a book about small cars from the 1920s, revealed the following related car accessory, called the Engo-Flator. A creation of a London-based manufacturer named Fluid Pressure Pumps Ltd, the Engo-Flator worked along the same principles as the Schrader pump, ie whip out a spark plug, install one end of the unit into the orifice, the other to the deflated tyre, start the engine, and hey presto, 1lb of air pressure per second headed straight to the tyre's tube. The illustrated unit cost 39/6, and included ten feet of hose line. A version without the pressure gauge cost a little less, at 36/6. References to the Engo-Flator are few and far between online, unsurprisingly perhaps. A brief article on the Daily Telegraph's website from 2001 makes mention of it, suggesting that it too was actually produced by Schrader (can anyone confirm?). 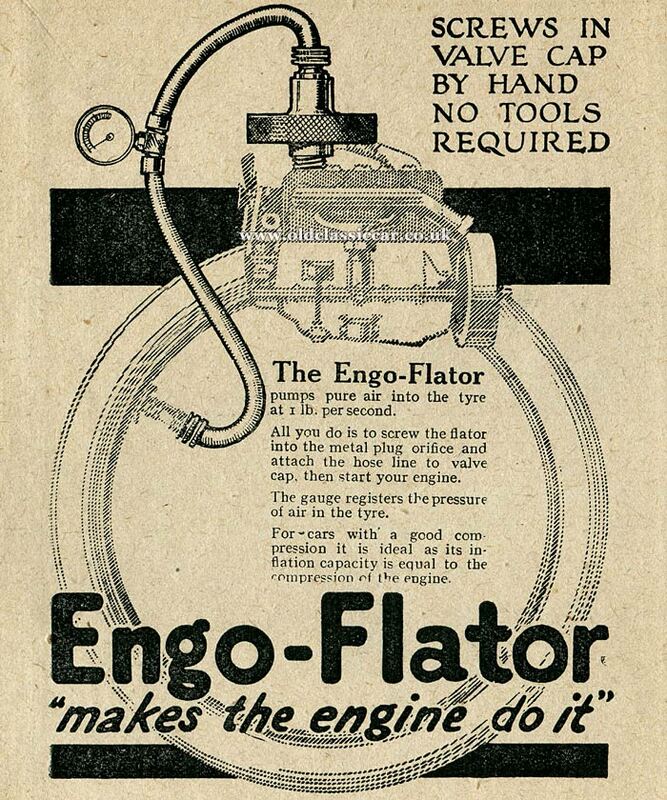 An article in The Commercial Motor from 1927 refers to a pump of this type produced by Fluid Pressure Pumps Ltd, but rather than calling it the Engo-Flator, it was simply referred to as The Pioneer air pump, but judging by its description is the same gadget. A 1926 mention in the same journal also uses this name for the product, and suggests that lorry manufacturer Karrier Motors Ltd had adopted the pump as standard equipment on their vehicles.